Using your mobile phone to make money transfers is probably the best way to pay for different services or send money to your friends and family. If you’ve used Pingit before, you surely appreciate the simplicity and speed of this money transfer service that you can by phone. What if we there’d be much more you can do with Pingit nowadays? Punters will be thrilled to learn that they can now use the Pingit payment method to deposit at betting sites within the UK. If this is the first time you hear about Pingit, don’t worry. We’ll provide you with much info on how the Pingit works as well as a list with the top Pingit betting sites. Since it is so fast and easy to use, Pingit was quickly incorporated by betting sites that wanted to offer a wide payment method selection. Because Pingit’s design is made with the UK market in mind, it offers greater speeds and increased security for both deposits and withdrawals at the biggest UK betting sites. Considered to be a popular payment method among young people, Pingit breaks new ground by being associated with all these huge betting sites in the UK. So, if you wanted to know which the best betting where you can make Pingit transfers are, scroll down! It comes as no surprise that William Hill was among the first UK betting sites to include Pingit in their mobile payment methods list. 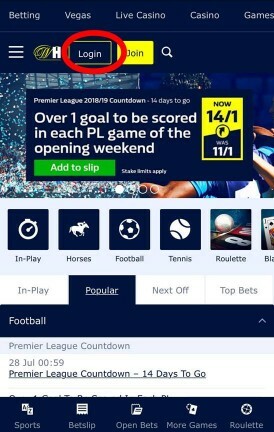 Known for their constant interest in innovation and bringing new services and procedures to their customers, William Hill has a spotless mobile website. It came as a natural move that they wanted the best mobile payment methods as well, that’s why they offer Pingit. 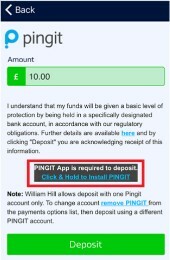 You can use Pingit for both deposits and withdrawals at William Hill, and there are absolutely no fees to worry about. A smartphone is all you need to deposit with Pingit at William Hill. Access your mobile account, choose Pingit from the available deposit options and confirm the deposit through the Pingit app. 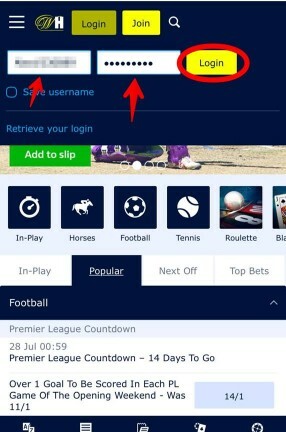 Deposits are instant and depositing for the first time with Pingit makes you eligible for William Hill’s new customer offers as well. 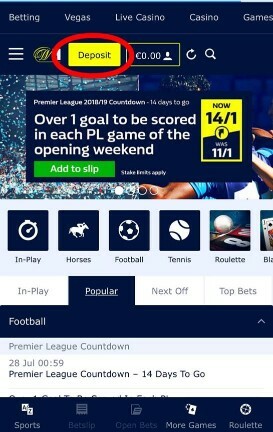 Another huge UK betting site that offers Pingit as a payment method for their mobile customers is Betfred. Since you can always expect high-quality services from BetFred, making Pingit available was just a matter of time. Implementing the payment method later than William Hill, Betfred wanted to give it rigorous testing first. You can use Pingit on Betfred for topping up your account and cashing out as well, and one great thing about this payment method is its deposit limits. 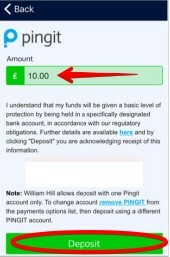 You can make a deposit as low as £5 using Pingit, and the same goes for withdrawals. While deposits are instant, withdrawals can take 1 working day to be processed after you pass the BetFred KYC procedure, of course. All in all, combining the great Betfred mobile app with the Pingit payment method will guarantee a smooth-sailing betting experience! A bookmaker known for its extensive list of innovative payment methods, including cryptocurrency, BetMotion couldn’t miss the opportunity to make itself more accessible to punters by implementing Pingit as a payment method. By downloading the Pingit app on your phone, you will be able to deposit and enjoy your favourite sports betting at BetMotion easily. Pingit is a great payment option for those punters that like to place live bets since the time spent making a deposit is very short and you can get straight into the action. You can comfortably use Pingit for pre-match bets as well. Whatever your betting preferences are, have fun with Pingit. We’re sure that you’ve already spotted a few of the advantages you get when using Pingit for deposits and withdrawals. For the seasoned punters, these advantages are evident. However, we’re addressing to all punters out there, experienced or not. That’s why we’ve made a list with the main advantages you enjoy when using Pingit for your betting activities. The app was first designed to allow Barclays account holder to transfer funds from one to another. However, the idea and the design were so appreciated that it evolved into a standalone payment method available for general use. You no longer need to have a Barclays account to use it; you can sync it with any other UK bank account. Since Pingit design appeals to mobile money transfers, everything about it is optimised so that you pay with no delays. Any money transfer is important, and you want the money to reach you fast, however, in the betting scenario speed is paramount. The security aspect is provided through state-of-the-art services and encryptions, the same that Barclays use. Since the Pingit app syncs with your bank account and the phone at the same time, you have the option to choose where the money comes from. You can use the connected bank account to transfer money straight from it, pay for the credit on your mobile phone, or you can choose that the paid amount comes with your phone bill. No matter how good, fast, reliable or secure a payment method is, punters can always find something bad as well. That’s the case with Pingit as well, it does have its flaws, and since we’re aiming to provide accurate information for our readers, we’re going to list these negative aspects below. One of its most evident drawbacks that Pingit suffers from is the lack of popularity among betting sites. Even though some of the top bookmakers in the UK have already implemented it as a payment method for quite some time now, others are not so fast to follow. We couldn’t identify the reasons that might stay behind this decision. Well, in complete honesty, no withdrawal method can provide instant cashing out of the funds. Either if we’re talking about a KYC procedure or simply about a small window of time the betting sites allow for themselves, at the best case you’ll wait a couple of hours before you receive the withdrawal. However, with Pingit, that period aside and you’ll still have to wait another day. That’s not a lot considering that a card will have you waiting three days, but it’s more than other payment options offer. So far we’ve covered the main betting sites where you can use Pingit, its top advantages and disadvantages, as well as defining what Pingit is and whom it addresses. However, a payment method review isn’t complete until we cover all ground. Next, we’re going to give you a detailed guide on how to make a Pingit deposit. If this is the first time using Pingit to deposit at an online betting site, download the app before moving forward. 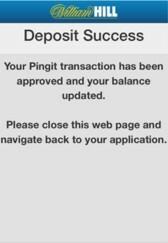 After you download and approve the transaction in the Pingit app, the deposit is successfully processed. You can only use Pingit from a mobile device. They have a website where you can find just about everything there is to know about this mobile payment method. However, if you want to set-up an account, you will need to download the Pingit app on your phone. The app is available in the App Store or Google Play, but you will only be able to download it if you have a UK account. Once you get the app on installing on your phone, you have to access it, and you ‘ll be guided through all the steps you need to follow to set up an account, link a bank account and all other useful information you may need to make great use of your Pingit app. As previously stated, Pingit is a reliable option for punters that want to make instant deposits and wait a limited time for the funds from withdrawals to be available. Performing better than many payment methods available online right now, Pingit can easily grow to become one of the most-used payment solutions. As you can see, Pingit is quite a complete payment method for punters, handling both deposits and withdrawals. Its major downside comes from the fact that punters can only use it in the UK and that’s why we also recommend some alternatives in case you’re betting from a different location. Can I Use Pingit Without a Barclays Account? Yes, the current version of Pingit allows you to use it with any bank account in the UK. The earlier versions of Pingit required a Barclays account; however, now it’s available for other banks as well. As long as you’re the account holder and you’re at least 18-years-old, you’re good to go. Can I Use Pingit on a Windows Phone? Unfortunately, not. Pingit only works as an app on your smartphone, and it’s only available on the App Store and Google Play. This means that only Android or iPhone users have access to Pingit for the moment. There’s no indication that they will develop a Windows phone app in the future. Can I Attach a Card to Pingit? Pingit works by allowing you to attach a bank account to the app and pay seamlessly from your smartphone. At this time, attaching a credit card to it is not part of the functionalities. However, it might become possible in the future. What should you know about Pingit?